Rory McIlroy turned 18 in May, but hasn't turned pro yet. He may regret that decision since he is playing in the high stakes Open Championship and competing well. After the first round, he shot a 3-under 68 and has a one stroke lead over Tiger Woods. He was the only player on the first day of play to shoot a bogey-free round. In 2004, McIlroy helped Europe win the Junior Ryder Cup. Using a sponsor's exemption, he made the cut this year at the Dubai Desert Classic. He qualified for The Open Championship by winning the European Amateur Championship last August. He is a native of Hollywood, North Ireland and his story seems like something written for Tinseltown. His goal is to make the cut at the Open and win the silver medal as the lowest-scoring amateur. 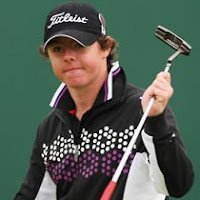 He very well may do better than the silver medal -- he just may win the Claret Jug. McIlroy believes that he will turn pro in September after the Walker Cup. Nearly 150 journalists attended his press conference and McIlroye remained poised. He admitted that he has become used to being interviewed. His first interviews were when he was 7 or 8 years old and interest in the teen sensation has grown since then. 0 Response to "18 year old has only Bogey-free round at The Open Championship"